One of Amazon’s best qualities is its willingness to step outside of its comfort zone to try something new. It doesn’t always work out in the company’s favor as the ill-fated Fire Phone demonstrated but even then, Amazon recognized its failure and adjusted accordingly. In the case of the Fire Phone, Amazon felt the best approach was to scrap the project entirely. Given the sheer volume of handsets already available and the fact that many markets were approaching saturation, discontinuing the device was a good idea. That said, axing a product that isn’t immediate successful certainly isn’t ideal in every situation. A prime (no pun intended) example of Amazon not giving up on a promising concept is playing out before our eyes. Amazon in March of 2015 unveiled the Dash Button, a clever piece of hardware that allowed for physical one-touch ordering of common household products simply by pressing a button. Need to reorder laundry detergent? Simply press the Tide-branded Dash Button stuck to your washing machine and Amazon will get it sent right out. 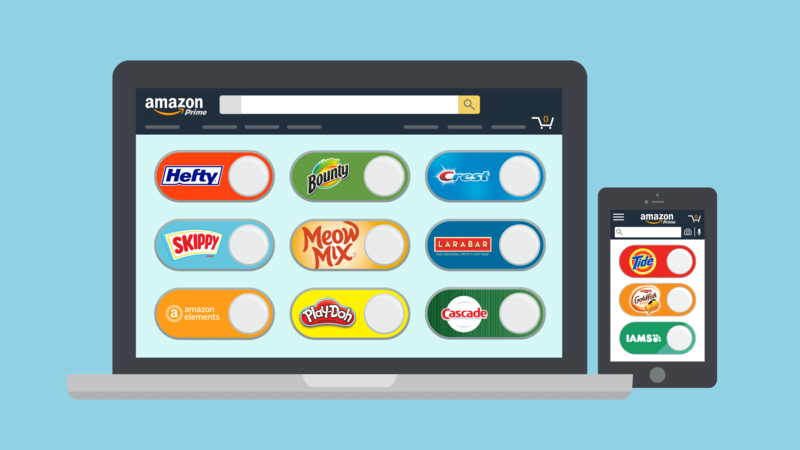 Amazon expanded its Dash Button program in mid-2016 with the addition of dozens of new brands yet still, the whole thing felt somewhat gimmicky. At its core, one-touch ordering is a great idea that’s in line with the impulse buy / instant gratification behavior Amazon has been successfully exploiting for years. Building on that concept, Amazon has taken the Dash Button digital. Prime members that visit Amazon’s website or use its app will now see a section dedicated to digital Dash Buttons. Initial offerings are based on your recent purchases although you can manage what’s shown to better fit your shopping habits. Tapping or clicking the white “buy” part of the button will queue up an order while tapping the brand logo will reveal more information about that specific product. Best yet, the virtual buttons are free to use whereas a physical button for your laundry room or kitchen will set you back $4.99 a pop. Amazon already offers 1-click ordering and Subscribe & Save but virtual Dash Buttons feel like a much better (and more visible) implementation and the natural next step for the buttons. Now, if Amazon can somehow create Dash Button ads that’d show up on other pages around the net, they’d be in business. Ads are already curated based on your online activity – why not make them immediately useful? The secret to online retail is to eliminate friction and make it as easy as humanly possible for customers to purchase goods. Amazon is an expert at this and digital Dash Buttons are evident of its expertise.